This, then, is the one we've been waiting for. The bad news? 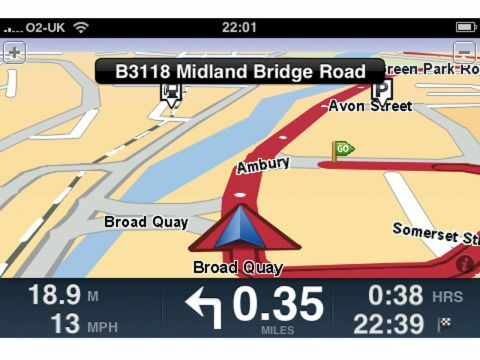 It's expensive, and cheaper apps (the UK edition of CoPilot Live is just £26, against the £60 of TomTom's UK edition, for example) can do the basic sat nav work of getting you from A to B. And it doesn't feature live traffic or fuel prices. And its POI database doesn't match Google Maps. But blimey, it's a lovely app. The level of polish is fantastic; its antialiased graphics are prettier than on actual TomTom sat-navs, though it lacks lane assist, and often struggles to parse contacts. It has TomTom's IQ Routes tech, which knows what roads get busy and when, and changes its routing based on when you're travelling. On its own, the app is great, though the iPhone struggles to maintain a GPS lock around tall buildings. But paired with the TomTom car kit, it's brilliant. GPS reception is rock solid and audio prompts are clear.